We maintain strict sterilization and cross contamination procedures to conform to rigorous standards in accordance with the ADA (American Dental Association), OSHA (Occupational Safety and Health Administration) and CDC (Center for Disease Control) guidelines. Our priority is the safety and protection of our patients and our staff! All instruments are sterilized before they ever enter a treatment area. Sterilization begins with total immersion in a disinfecting ultrasonic sink that removes any microscopic debris, or a Miele Thermal Disinfector that acts like a highly specialized dishwasher that will also clean disinfect, and remove debris mechanically. Instruments are then individually sealed and/or wrapped and put into an autoclave that reaches 275 degrees F, and 31 PSI, killing all possible viruses and bacteria. For every cycle we run, an indicator strip is placed inside the autoclave to ensure the load reached the correct temperature and pressure required for proper sterilization. Once per week, we perform a spore test. This is done on each autoclave to confirm that the machines are performing to the highest safety standards. We also replace disposables after every single patient. 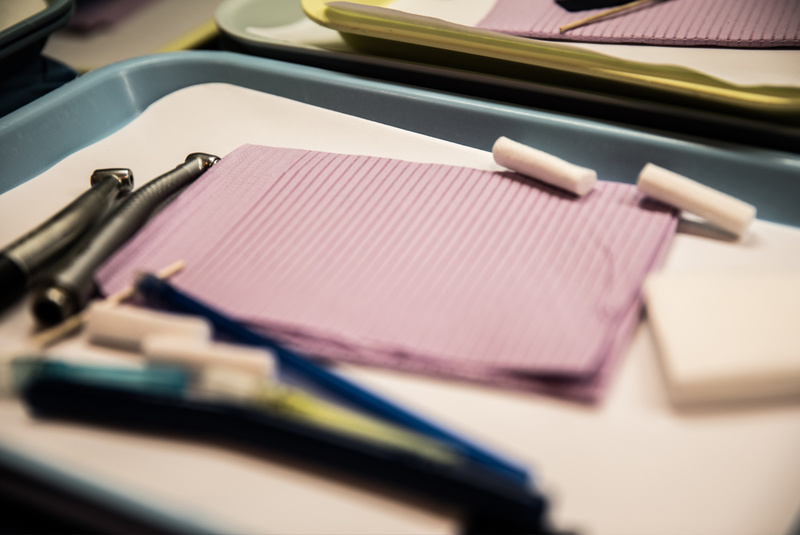 Disposable items include; suction tips, sheaths for light handles, tray covers, and patient bibs to protect clothing. During treatment, all staff wear masks, safety glasses and gloves. If a staff member needs to leave the treatment room for any reason, gloves are always replaced with a new pair. Patients are always given safety glasses to wear for eye protection. Every treatment room is disinfected with an antibacterial disinfectant solution. The dental chair as well as countertops, x-ray heads, handles, hoses, and any other surfaces used are thoroughly disinfected after each patient. All staff maintain certifications with the American Heart Association for Basic Life Support (CPR & AED) training. Our clinical staff also attend continuing education courses on hazard communication, bloodborne pathogens and radiation safety. I have only had good experiences at Stowe Family Dentistry. John is super competent, kind and helpful. I have liked all the people who have worked on my teeth. You hire very nice, super competent people. Thank you for your great service! This what the first time I could not tell which tooth was being worked on. Jitka is an absolute pro with her tools, being very fussy with getting a correct bite and smooth finish. I think she is the best dentist I have ever had! Chris explained my procedure in depth! Talked to me to let me know what was happening throughout the procedure! Followed up with me later that evening with a phone call to check in on me! Yesterday was the best dental procedure experience I have ever had. She was concerned with my comfort, which made me feel comforted and relaxed. Both procedures were done with expertise that resulted in great comfort today, no continued pain. I was met early without waiting. Her assistant was also very eager to make my experience pleasant. They have a very happy patient. My most sincere thanks to both of them. I was hesitant on having a new hygienist since Ann retired. She was the best in my opinion but…. my new and only hygienist is terrific! She is very thorough and informative. I’m pretty sure her name is Bonnie. As always at Stowe Dentistry…. in the way of dentistry…. excellent! I am a very anxious person and very skeptical about dentists. I have been going to Stowe Family Dentistry for years and it never goes downhill… it only gets better because they are so caring, clean, and careful. I have never run into a staff member with an attitude. They are ALL always so very nice! Jitka was very professional and to the point on my initial visit. I really like my previous dentist and knew she would be hard to replace. Jitka put me at ease instantly and offered great advice in order for me to make the best decision for my situation. She was very considerate during my extraction, always making sure I was ok and/or needed anything. Even asked if I wanted a break to rest my jaw during the lengthy procedure. I would recommend her and the Stowe practice. The entire team was eager and pleasant to work with. Emily and Chris were great. We had genuine conversation and laughed a great deal. Always a relaxing visit. Stowe Family Dentistry was very helpful in rescheduling my appointment after a family emergency. The care I have received thus far has been exceptional. Sara clearly communicated issues I am having with my gums and the best track of care going forward. Dr. Matherly is hands down the best dentist I have ever seen. She is so welcoming and understands fears of getting fillings done. Lynn is also great – both make the experience much better. Paula is extremely professional and informative. She told me the importance of proper dental hygiene to prevent strokes and heart attacks as well as being very personable. We actually know some of the same people from Vail, CO! Can’t praise her enough for her skills. I broke a tooth over the weekend. Yes, it was one that your office had scheduled for a crown. I was procrastinating. I called your office on Monday, wand was scheduled for Tuesday morning. Dr. Matherly and Kate were a great team. Cheerfully, painlessly and professionally they took care of business and installed a new crown. i am so grateful that there are still service providers who care about and take great care of their customers. Thank you! I was a bit nervous about seeing a new dental hygienist. Anne Worth had been my hygienist for years. She knew how to make me comfortable during the grueling scaling because of my sensitivity. Sara was very open to my suggestions what Anne did for me. Sara was wonderful! I felt no pain. Kudos to Sara! I look forward to seeing her in May.